The Baby Blogs: Off to the Races! Off to the races! Let me outta here!! It's all mommys fault. Really, if anyone is to blame, mommy is the culprit, the designer of her own fate. I say that in response to her and abba's complaints that, when let loose, all Lucas and I do is run. We never ever stay put in one place for more than two seconds. In fact, without looking back, we just surge forward with all the speed we can muster! Usually toward streets or parking lots. This fact was discovered during our recent weekend away. Due to beautiful weather we spent our whole weekend outdoors at a kibbutz near the Dead Sea. 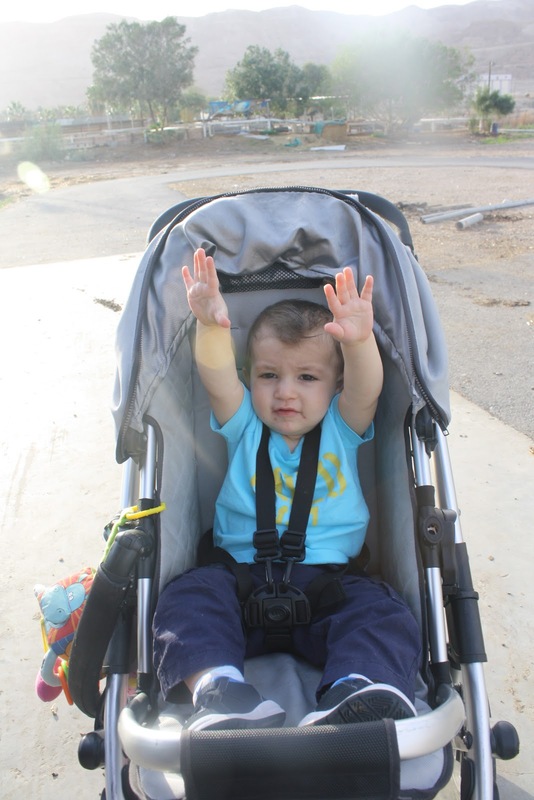 If we weren't held or strapped into a stroller we would simply run. No amount of toys or people could tempt us to stay in one isolated and safe area. And nothing could hold us back, except for that stroller with the straps or being held in a vice grip by some adult. Dec. 10, 2009: Mommy runs a half marathon. Nine months later I am born. March 25, 2011: Mommy runs a full marathon. Nine months later, Lucas is born. It is simple: mommy's actions while we were en utero are now causing some dire consequences. Some 13 miles with me and then a full 26 miles (42.2 km) with Lucas - what can you expect from us but to run like small lunatics? So much so that mommy was too tired to really run, as in train. However, we probably helped her get in about 10 unofficial miles of running in one day. In circles. Exasperated, drained and feeling like a wrung-out wash cloth, mommy decided on our drive home to change all the rules. TV has now become completely acceptable if not highly encouraged in our home. Any show that would captivate us and cause us to sit still for even 15 minutes straight would be ushered into our home on a red carpet. When we got home, mommy and abba immediately implemented this new rule and plopped us in front of the TV praying we wouldn't move for at least 2 days. It was a nice sentiment. Now lest you think that this half marathon coming up on Friday is a harbinger of more Jansezian runners to come, it is not. However, it does mean that Lucas and I will only glean even more running adrenaline! We plan to greet mommy and her friends at the finish line. Perhaps we will run there! We'll keep you posted! Thanks to everyone who donated to Shalva via this exciting run! Captives. But not for long! Muahhhhh!! i love the pictures of them riding the horses!!! SO CUTE! hahaa. Hopefully one day they can turn their energies to actually running and complete a marathon! Then you know you influenced them and be thrilled about it :) haha.